Market competition, risk, budget limitations and environmental, health and safety regulations are key concerns of chemicals companies as they strive to maximize their efficiency and quality of production – and giving customers what they need when they need it is critical both operationally and financially. 70%* of surveyed Knovel users at chemical companies use Knovel to develop new or improved design and products, meet compliance and regulatory requirements or get up to speed. Engineers on chemical R&D teams face increasing development and production challenges, from the search for suitable substances to meet specific applications to the need for best practice data to compare against internal measurements. And Knovel can help. Chemical manufacturers are charged with reducing plant and manufacturing costs, and mitigating EHS risks with plant designs and systems. Knovel helps by providing manufacturing and engineering staff with access to design change examples, materials property data operational best practice insight, and more. A global chemical company wanted to create new materials for its polymer platform and tasked chemist James Elmont with the project. The project involved finding and evaluating high performance, costeffective and biodegradable polymers within budget. 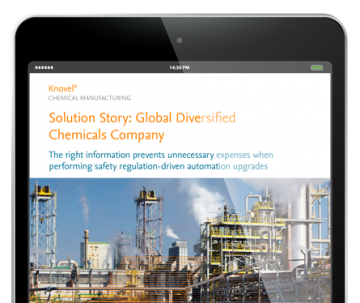 After a process hazard analysis, a diversified chemicals company believed that an upgrade of automation systems was needed. However, using the comprehensive resources in Knovel, the engineer in charge could successfully implement a second assessment that showed the expensive upgrade could be avoided.